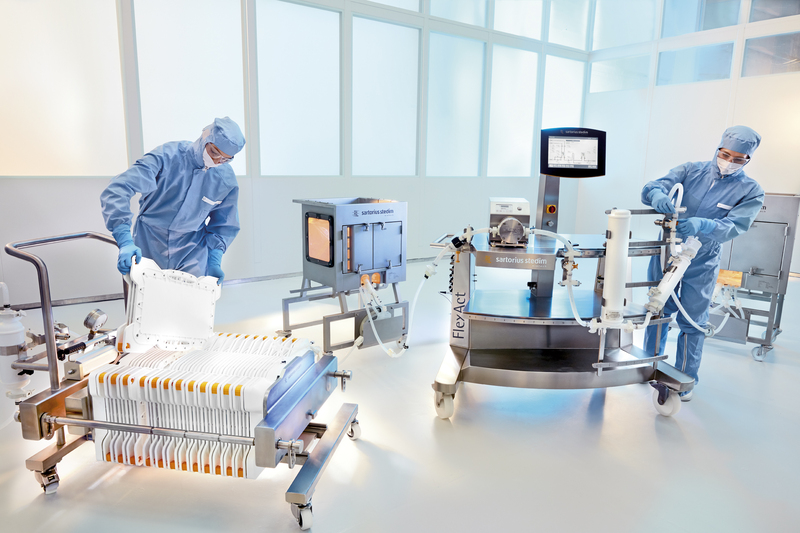 Sartorius Stedim Biotech (SSB) has expanded its range of single-use membrane chromatography solutions with Sartobind Cassettes. This convenient, pod-like modular system has been developed for commercial applications in both capture and polishing. New Sartobind cassettes offer the same flow path, bed heights (4 and 8mm) and void volume ratios as Sartobind capsules, and are compatible with Q, S, STIC PA and phenyl ligands. The new design goes beyond the previous 5L size limitation for capsule formats, expanding the boundaries of membrane chromatography. Multiple cassettes, each with 0.8L or 1.6L membrane volume, can be set up in three different stainless steel holders resulting in maximum membrane volumes of 20, 50 or 100L, respectively. Data demonstrates direct scalability from the 3mL Sartobind nano capsule to 20.8L (13 cassettes) in the Pilot Filter Holder. Pressure-flow performance and the shape of breakthrough curves are identical to the smaller capsule sizes, independent of the number of cassettes used. Set up can be accomplished within minutes, even at manufacturing scale, whether for capture applications or for flow-through removal of process contaminants. The capture of large proteins such as viruses and virus-like particles (VLPs), protein conjugates and blood factors plays a key role in modern bioprocessing. The Sartobind cassette system now enables large-scale bind-and-elute membrane chromatography for such targets.